Twelve-year-old Angus lives and breathes horses. His father is a horse trainer, and on most mornings before school, Angus is down at the racecourse helping him out. 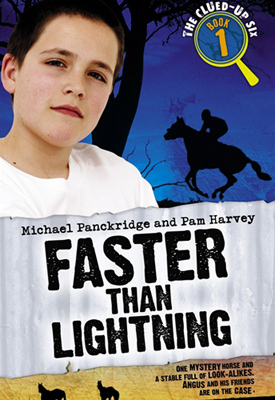 After a scary incident at the track one morning, Angus, with the help of his friends, discovers suspicious goings-on at the local stud farm. When a horse, Lightning Strikes, appears to be the exact replica of a dead horse, Gale Force, Angus knows something’s definitely not right. Is the stud involved in a special breeding program, or is it something more sinister? It’s up to Angus and his friends to find out – before it’s too late.